To put the oven next to the refrigerator is not recommended. But in the case of the use of dividers between the kitchen devices and minimize their impact on each other, this kitchen layout can be implemented. An explanation of the undesirability of installation the oven and refrigerator next to each other is the allocation of these devices a large amount of heat during operation. Upon exposure of the devices to each other, the heat generated may damage both the device or disrupt a whole system work devices. This can lead to premature wear of the oven and the fridge. Cooling system of refrigerator is powered by heat in the external atmosphere – that's the back of the refrigerator is constantly heated. The outer surface of the side walls and rear wall of the refrigerator needs to be restricted from external thermal effects, otherwise the internal compressor of the refrigerator will be forced to work more powerful and overheat. Because of this increased level of heat can be reduced the life of the refrigerator. In addition, heat from the surface of the refrigerator may turn yellow. 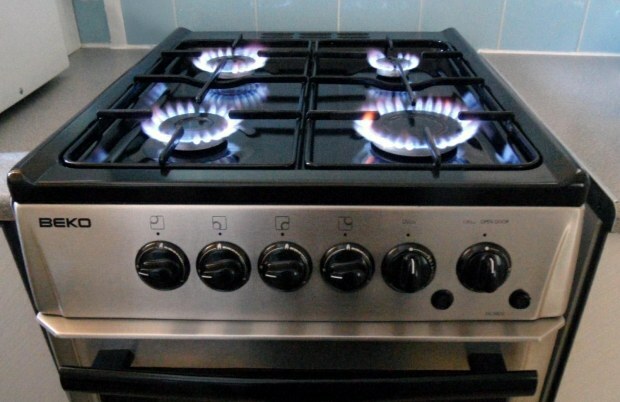 When exposed to heat discharge of the refrigerator on the included brass plate can be a risk of sparks and a sharp increase in the burning flame in the oven. When you use certain security measures and materials-Delineator oven and refrigerator can be installed next. The main condition of this neighborhood is the need for a gap between the devices is 15 cm or more. Between an oven and a refrigerator in the left gap, you can install a small shelf or narrow Cabinet. As a means for differentiation can be applied a special coating on fridge or setting built-in oven. To minimize the thermal impact from the oven to the refrigerator the surface of the refrigerator can be covered in heat reflective foil (also known as foiled Isola), which will be mirrored to reflect back the heat allocation, minimizing their impact. When using foil, you can put a wardrobe and a fridge is not only near, but also to set an oven on top of refrigerator. Another way of differentiation is to use furniture partitions. As such partitioning can be a furniture frame for the installation of the oven. Built-in oven is a popular modern solution to picking dishes, including the design objectives. A closet will protect the refrigerator from the thermal effect of the oven. Between the furniture body and a refrigerator are also encouraged to leave additional air gap.